The Black-and-whites signed a preliminary agreement with Vodafone Türkiye, who are willing to buy both the name of the future stadium and prime spot on the shirts of BJK players. Milliyet.com.tr report. Beşiktaş and Turkish branch of Vodafone telecommunications signed a memorandum today to show their commitment to future commercial cooperation. With demolition of the old stadium only just beginning, it’s already almost certain that Vodafone will be the naming rights owner for years to come. Though talks are understood to be in progress and speculations over duration and value of the contract would be premature, this cooperation is thought to have a long-term perspective. 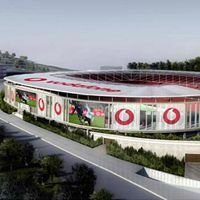 StadiumDB.com understands that the future stadium will not lose the name “Inönü” after rebranding in 2014, though the final name hasn’t been unveiled yet. The below rendering shows potential outcome of the rebranding operation, though it is – thankfully – unofficial. This suggested layout is very invasive and changes completely the concept accepted by local authorities, fitting almost seamlessly into the surroundings.